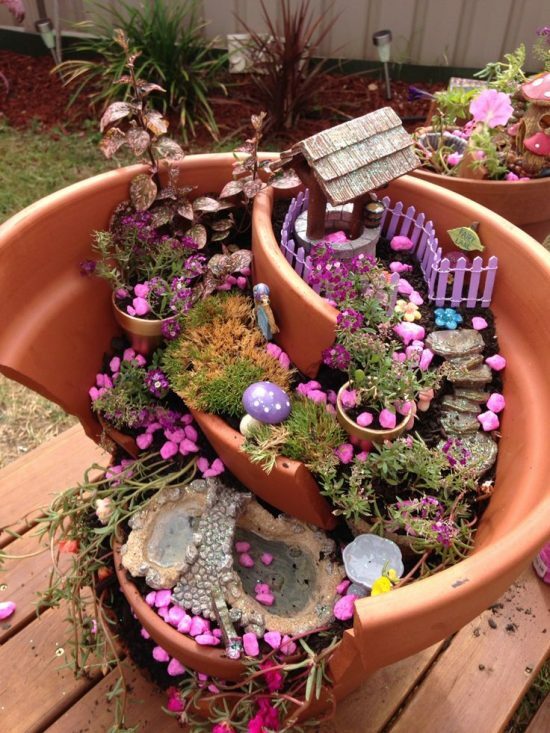 You will love this Broken Pot Fairy Garden Tutorial and they are so easy to make when you know how! Watch the Video now. At some point in time, you may find yourself with Broken Clay Pots on your hand. Well, don’t despair. It’s so easy to throw them out, but why? They can have so many uses. In fact, that cracked Chiminea could also be instantly transformed. 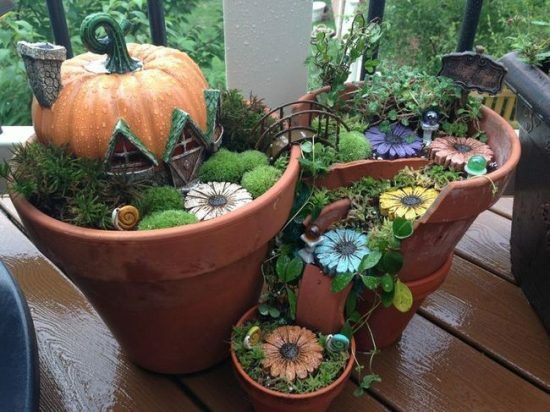 You will be so surprised to know that you can take many of your damaged house and garden pieces from drab to fab so easily! 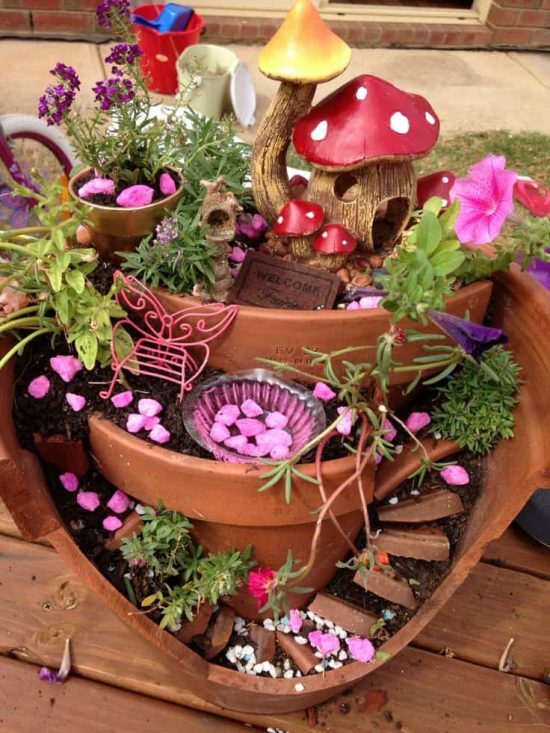 Today we are going to show you how you can repurpose those Broken Pots into fabulous fairy gardens. 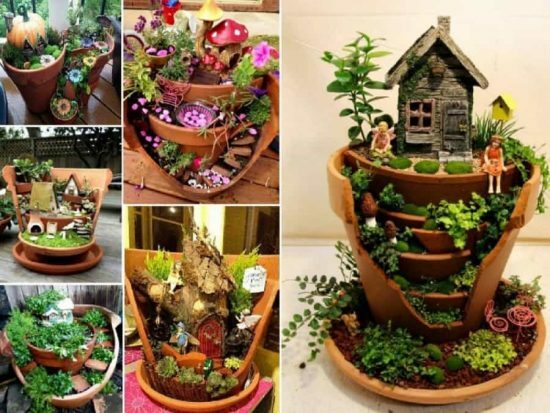 Above is a beautiful example of what can be achieved. 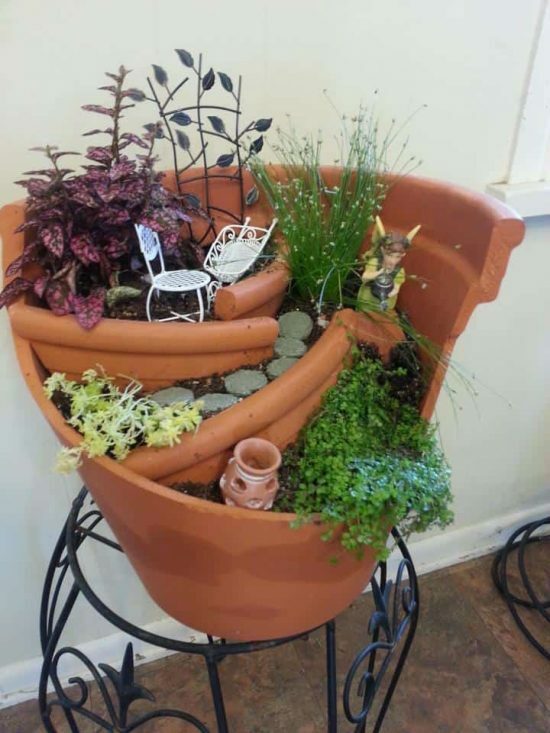 You can go big or small with your Pot too. This version looks incredible. The height of the tree on the right gives it a very imposing and impressive appearance. 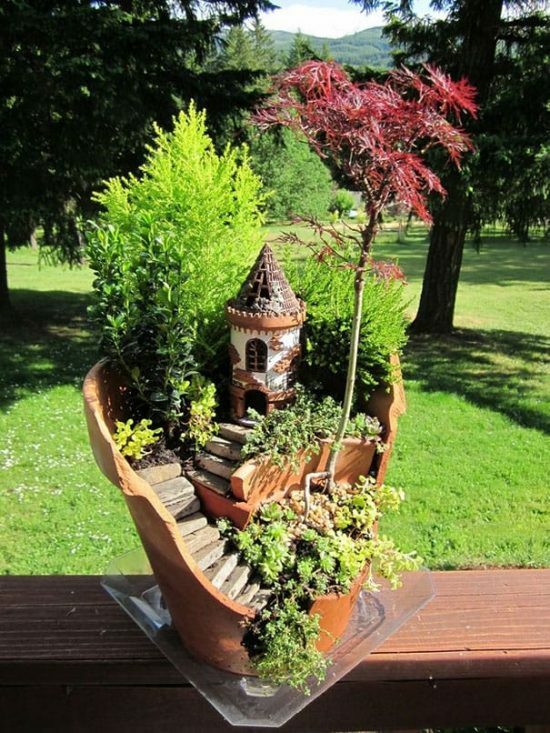 The Turret at the top, gives a beautiful whimsical touch. 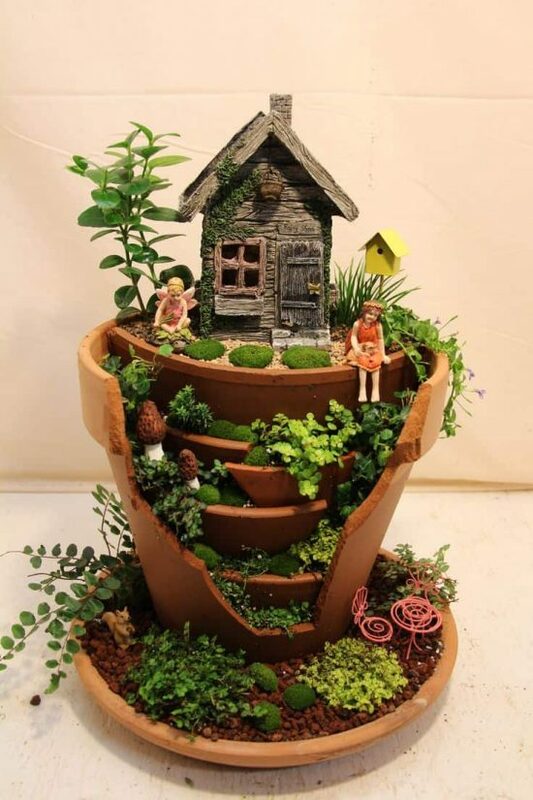 You can also add some height to your Broken Pot Fairy Garden by adding a base like below. 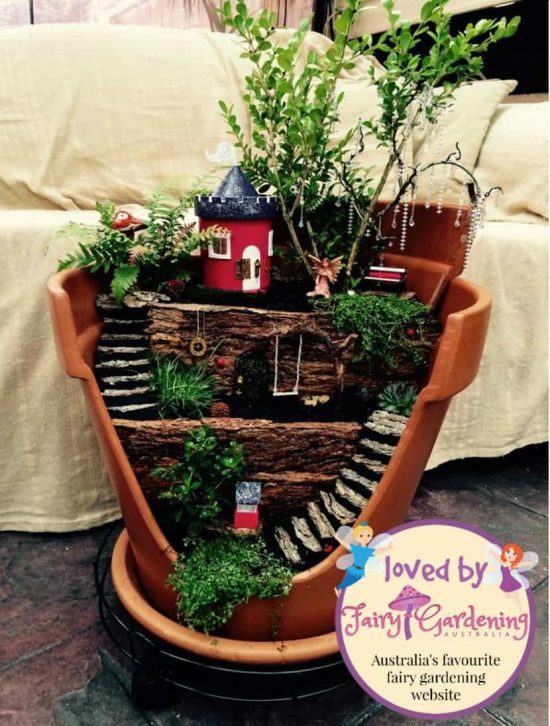 This will elevate your fairy garden and showcase the elements better. 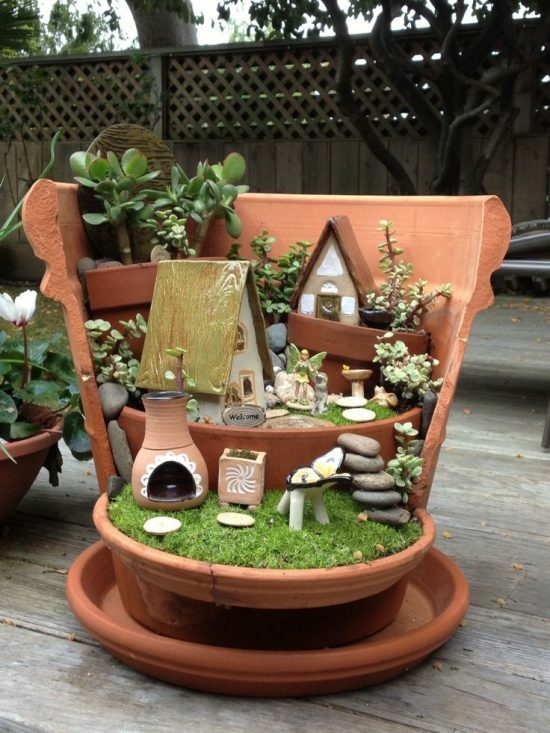 As you can see by this collection of Broken Pot Fairy Gardens on Pinterest, anything goes. 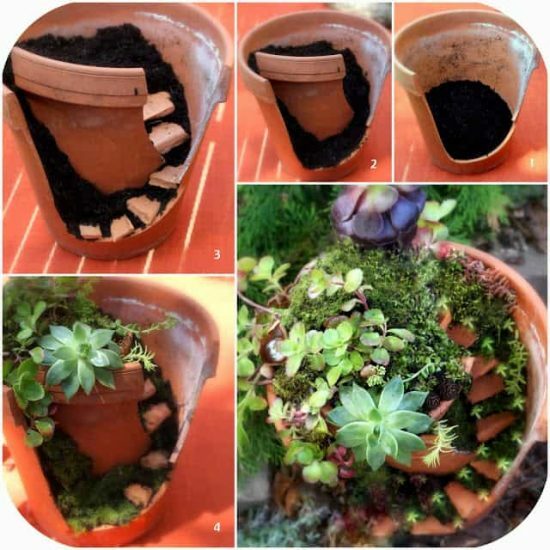 Get as creative as you like! 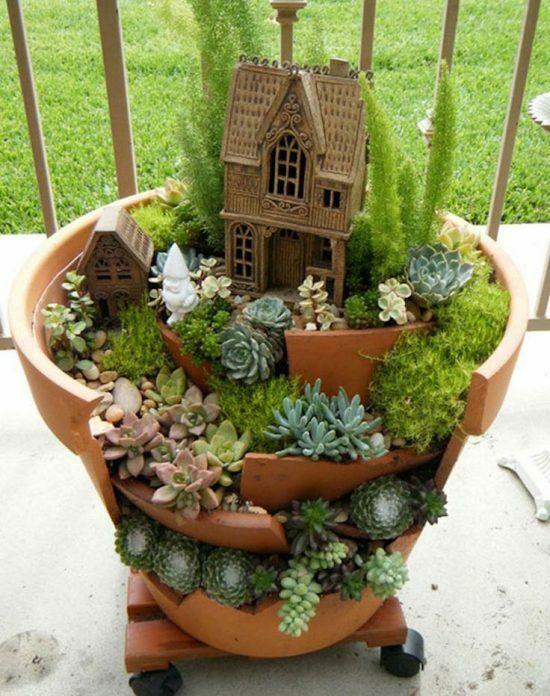 You can include wooden fences, succulents, mini trees, moss and don’t forget a fairy door! 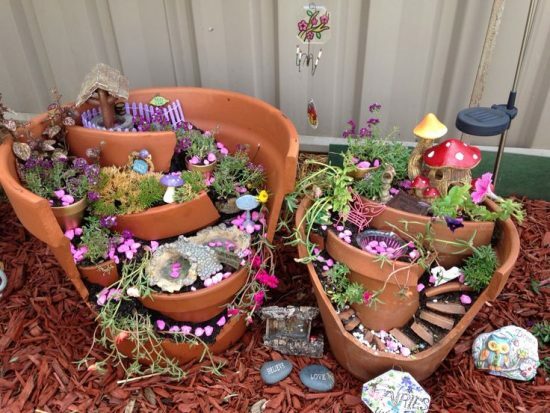 The lovely Broken Pot Fairy Garden below was made by a follower of our Facebook Page. What a great job. Carolyn has added a magical tree trunk and a raccoon in the left corner. 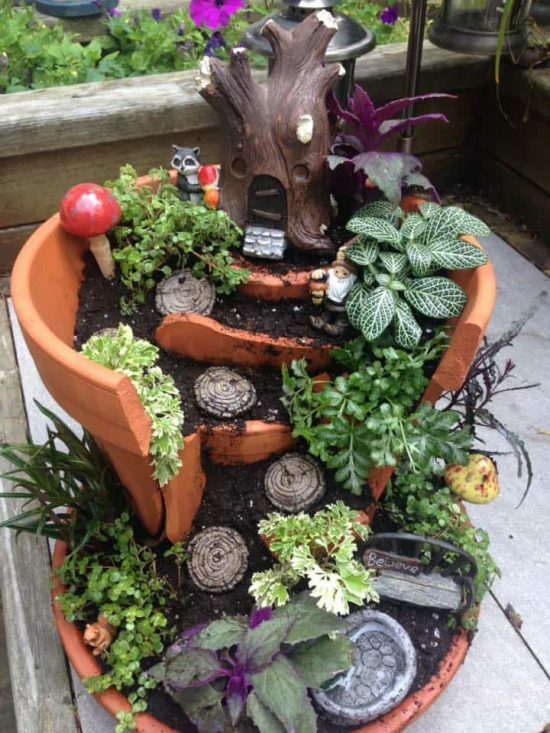 We love her choice of plants and stepping stones. 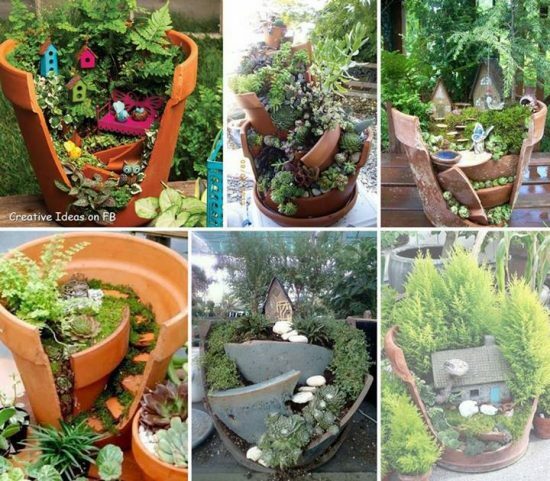 You can use an assortment of different sized pots in your Broken Pot Fairy Garden as shown below. 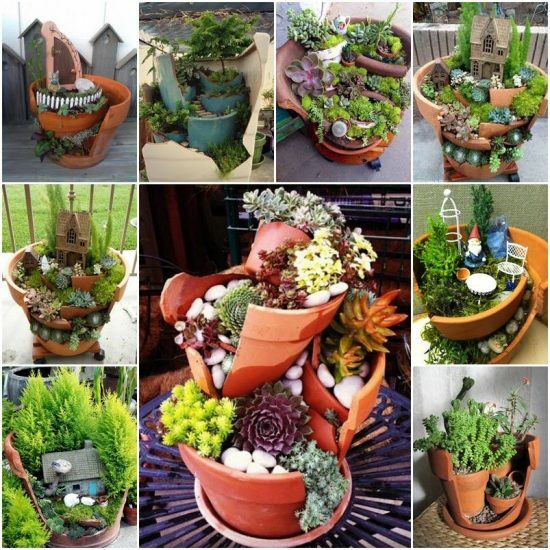 Just be sure that when you are looking at adding additional breaks to your Pot that you cover with a towel, use light taps and wear some goggles. The shards are particularly dangerous so don’t take chances. 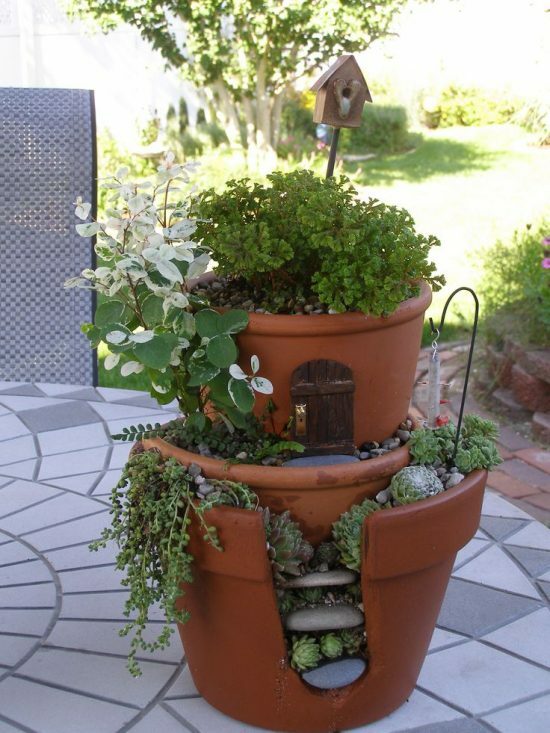 Succulents are a great choice for your Broken Pot Fairy Garden. 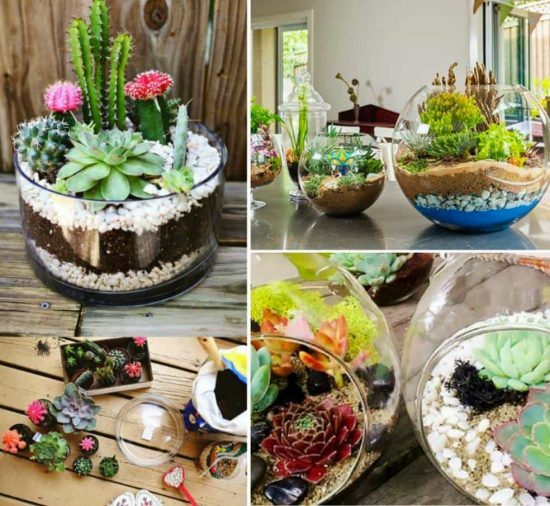 They also don’t require much maintenance or watering. 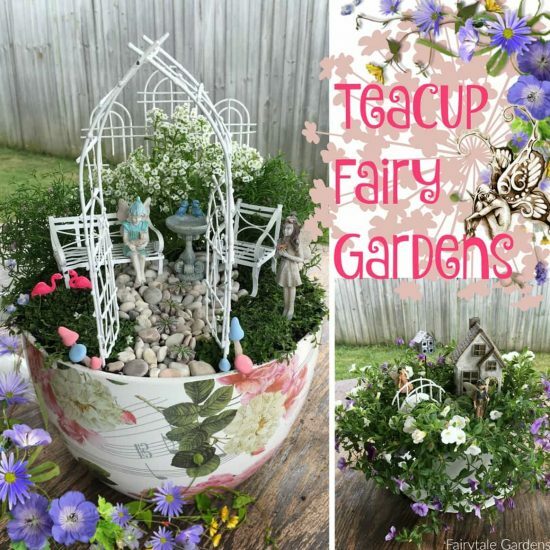 They add to the magical look like the one featured below via Daily Colours Blogspot.